Quality Air Heating and Air Conditioning > Articles > Air Conditioning > Columbus AC Question: What Does an Air Handler Do? Columbus AC Question: What Does an Air Handler Do? Your Columbus HVAC system is a complex system filled with vital components tasked with keeping you comfortable. One of the most important of those component is the air handler – the device responsible for circulating the heated or cooled air produced by your system through the vents in your home and into each of your rooms. There are a few different types of air handler as well, depending on the size of your Columbus HVAC system and the nature of the heating and/or cooling used. Most homes, for example, use terminal units which consist of just an air filter, blower and coil. This very simple system is all you really need to heat and transmit air through your ductwork. Your air handler is an incredibly important component in your Columbus heating and cooling system. Without it, all that heated and cooled air you pay for each year wouldn’t reach you. So, make sure to keep your system in tip top condition. 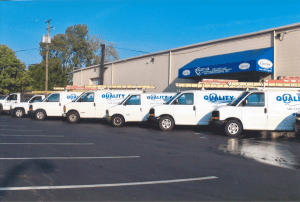 Call Quality Air Heating and Air Conditioning today if you need any service on your air handler or AC unit!